Getting excited for International Year of the Reef 2018?? So are we!! 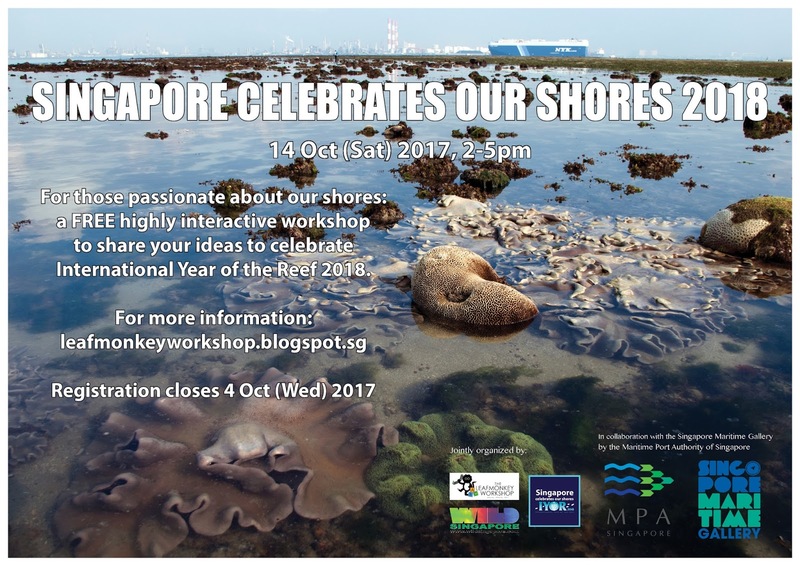 If you are passionate about Singapore's shores AND are ready to share and discuss ideas for celebrating International Year of the Reef 2018, join us at The Leafmonkey Workshop: Singapore Celebrates Our Shores 2018! 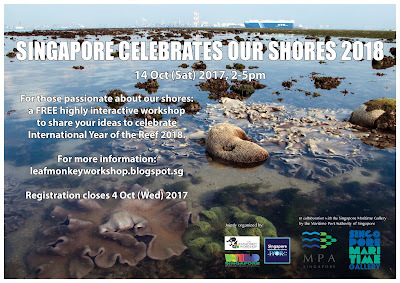 This workshop is organised in collaboration with the Singapore Maritime Gallery by the Maritime and Port Authority (MPA), and will be conducted by the amazing folks from The Leafmonkey Workshop. On top of actively engaging with other enthusiastic members of the marine community, workshop participants will be treated to a brief tour of the Singapore Maritime Gallery. This is a wonderful opportunity to discover how one of the world's busiest ports also has rich marine biodiversity, through fascinating exhibits and from the gallery's expert guides. What's more: guest speaker, Ria Tan, will be sharing her knowledge and experience of Singapore's marine environment. Ria Tan is an ordinary person (not a scientist) who is passionate about Singapore's marine life. She runs wildsingapore.com for those who want to learn and do more for Singapore's wild places. For more than 15 years, she has been regularly monitoring about 50 Singapore shores, making about 100 surveys a year. She also trained volunteer guides for intertidal walks at Chek Jawa, Pulau Semakau, and the Sisters Islands Marine Park. PLEASE REGISTER HERE Registration is strongly advised as it allows us to better customise the workshop to match YOUR interests.